After our trip to Greece in the fall of 2010, we got into one of the Greek’s favorite food combinations: feta & spinach in phyllo pastry. We have since concocted a few variations on this theme. 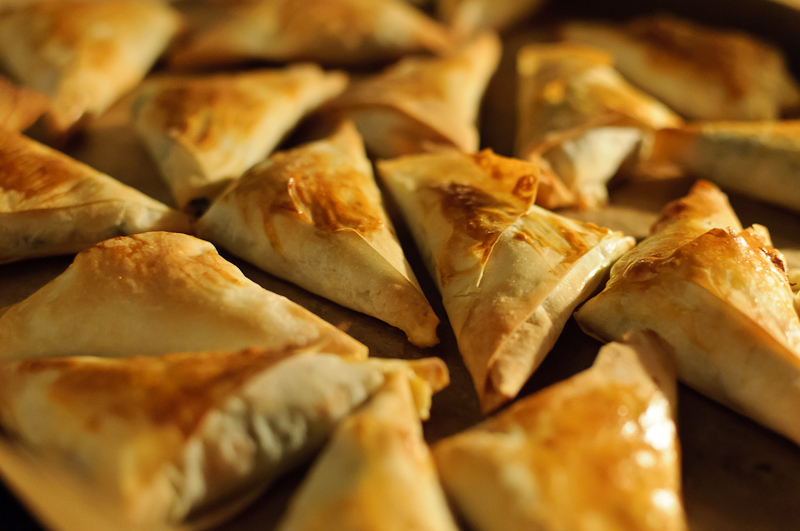 Here we added some roasted red peppers and onions and folded up the phyllo into triangles to create some tasty little snacks (or appetizers). Normally we would opt for fresh spinach, but our supermarket doesn’t yet carry it, so we had to use the frozen stuff. If you can get some fresh at your local supermarket, do. Also, give roasting your own red peppers a shot! It is really quite easy and I find the red pepper flesh comes out a little sweeter and juicier this way. First you need to roast the red peppers. To do so, set your oven to 200 c, place the red peppers on a tray or baking dish. Bake them for 30 minutes. at that point flip them and bake for another 15-20 minutes. They are ready once the skin can easily be peeled off. They may look like the skin is getting burnt in places, but don’t worry, you will be removing the skin anyways. Once they are roasted, take them out of the oven and let them cool. Then remove the skin and the seeds inside (I sometimes rinse them under cold water to get rid of all the seeds). Finely chop the red pepper flesh into small pieces, about 1×2 cm pieces. The feta will bind all the ingredients into a workable filling. Prepare the phyllo dough by cutting it into ~7 cm (or ~2.5 inch) wide strips. You will need approximately 25-30 of these. You need to make fast work here because the phyllo will dry out and harden if left out. Brush the strips with melted butter or olive oil. Add a spoonful of the filling at the top of one of the phyllo strips, fold the corner of phyllo over to enclose filling and form a triangle. Continue folding strip, like on would fold a flag. For some step -by-step pictures of this, please have a look at this recipe. Do this for all 25 -30 strips, or until you finish off the filling. Put all the triangles onto a tray that is well greased or covered in wax paper. Then brush the triangles with the egg yolk and place in the oven. Bake for 15-20 minutes, flipping the pan halfway so that it bakes evenly. You may want to flip the triangles near the end as well. i know, not getting fresh spinach is kind of getting ridiculous – how can they have everything from strawberries (!!) to asparagus right now but no fresh spinach :-(? Ahh finally our supermarket has some baby spinach. Well, its a start! Tis the season. Great picture!!!! These triangles look awesome!! Thanks Lu! Glad you liked it!